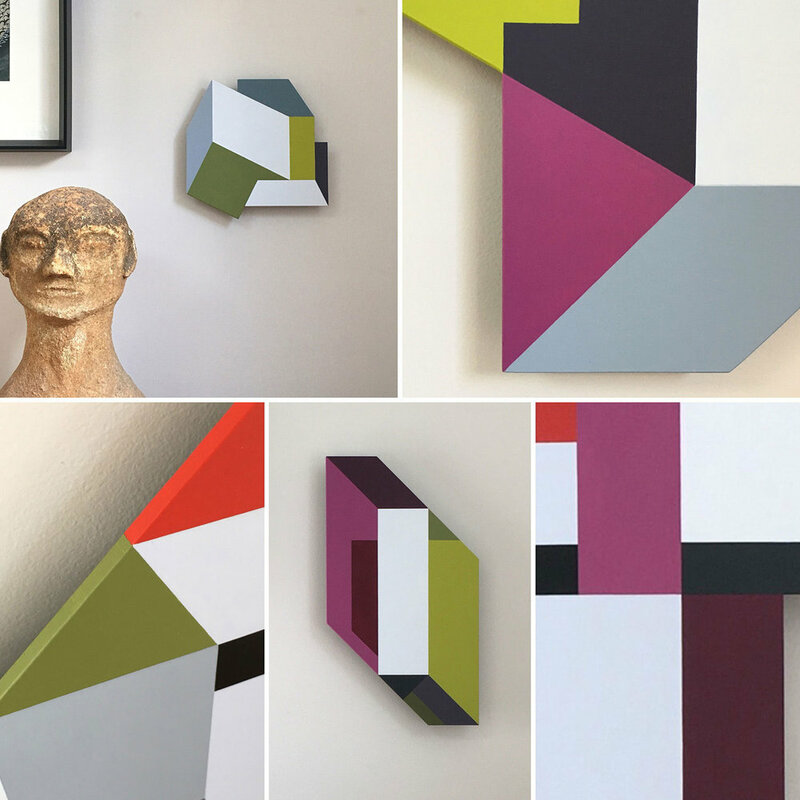 I've been working on some new small wall sculptures (or shaped paintings) - I'm still a little stumped about what to call them, because I don't want to confuse anyone! The image at the top gives you a sneak peek at some of them. They are all hand painted, with no masking tape used, just a steady hand, a paint brush, and my trusty ruling pen - more about ruling pens in this blog post. . . . I love my ruling pens! Over the next couple of weeks I will be photographing the new work and getting it up on my website, but for now here are some in-process shots below - including the last one using tinned tomatoes to hold the mounting blocks on the back while the glue sets (just as well tomatoes were on special this week). Actually, I said no masking tape was used but you'll spy masking tape in one of the photos below - what I meant was no masking tape on the visible surface to create the coloured areas, I masked the edge of the back face, to keep it clean when I applied my coats of gesso (that's what goes under the acrylic paint, to give it a surface that it likes to adhere well to). Since taking these photos I've bought myself a fancy little tripod and mount for my iPhone, to make photo taking easier without the outlay of a big new camera. I'm hoping that the tripod plus a new photo app (and some practice!) will lead to some better photos from now on, especially in winter when the light is not so strong. Bear with me, there will be a bit of a learning curve I'm sure! If you would like me to send you more descriptive images of any of these new pieces let me know, especially if you don't want to wait until they get to the website. They all sit off the wall (so they look sort of floating) which allows them to cast a nice shadow - because I love shadows, even more than ruling pens!! And finally, if you've read this far I have a favour to ask - please email me to let me know whether you think these are best described as shaped paintings, or wall sculptures- it would be really helpful to know what you think so I can label and promote them correctly!